Unpredictable. If there’s one word to describe this sport, that’s it. 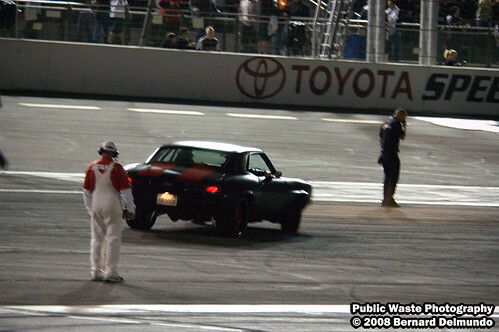 It only makes sense when you have a sport built around controlling a car in a situation that’s normally considered out of control. 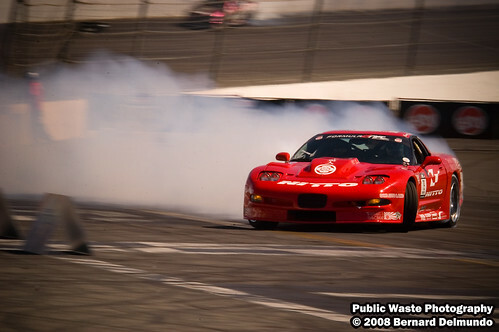 I remember coming to the first ever drift event held in the parking lot of the Irwindale Speedway, and it’s great to come back and see how much the sport has evolved on US soil. The day started hours before the gates were even open to the public. 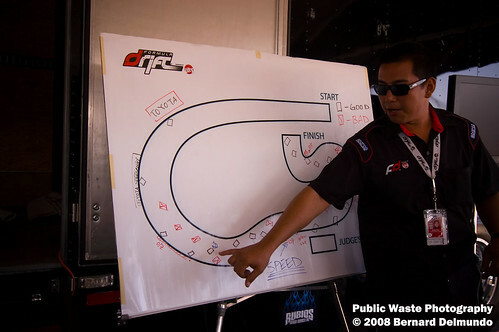 Administrative meetings between Formula D staff, media personnel, and the drivers took place while the line to enter grew longer by the minute. 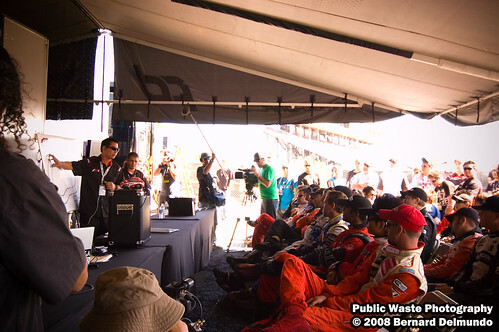 The look on all the faces at every meeting told the story: everyone wanted to start the action on track. After a quick review of the correct line and judging tips, the drivers got their chance to warm up and practice. Eyes peered through the fences from the general admission line still waiting for 2pm and the gates to open. With tires smoking, the drivers gave everyone a quick preview of what was to come later in the day. The practice continued as the gates finally opened. Some people took advantage by getting to their seat early while others decided to check out the off-track action. 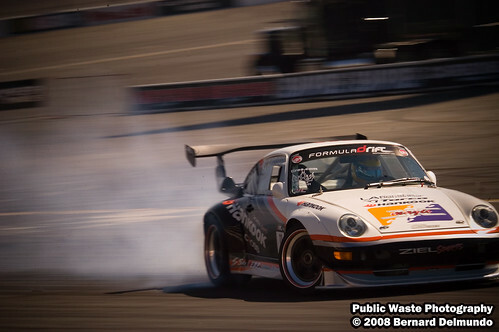 If drifting isn’t your thing, that doesn’t mean you can’t enjoy a Formula D event. The pit area was open to the public giving everyone a chance to get up close and personal with the cars and their drivers. These are some serious machines and tons of up and coming drivers were on hand to check things out and ask questions. Still doesn’t sound like it’s for you? Mixed in with the pit area were numerous vendor and sponsor booths. Everyone was showing off the best of what they have to offer including one of the most popular off-track booths, the Prestigious Models booth. After qualifying runs and the top 16 drivers were in place, it was time for the big show to begin. The stands were packed and the excitement was high. 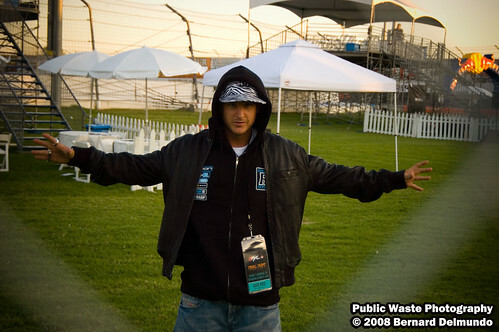 Special guest Rob Dyrdek was on hand to lead the driver’s parade and help to introduce all of the competitors. The final 16 put on a fierce showing for everyone in attendance. Tandem drifts are very exciting to watch. The closer the cars get, the more cheers come from the crowd. Some got too close resulting in some of the loudest cheers of the night. 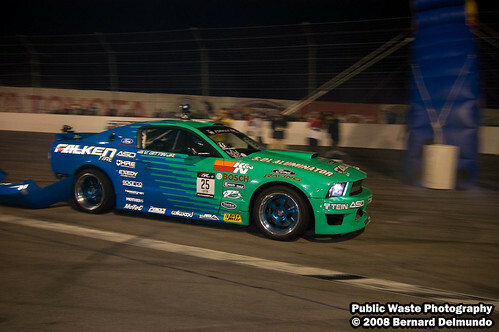 There were tons of surprises including Rhys Millen being knocked out in the first round of competition. 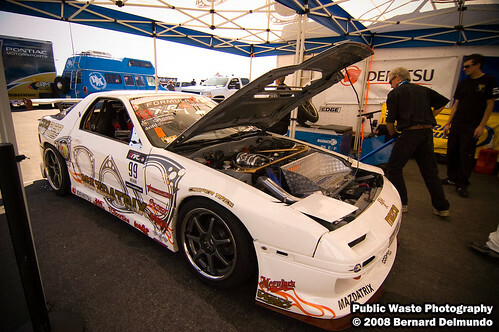 Another included Justin Pawlak and his RX-7 beating out Michihiro Takatori and his R34 Skyline for third place on the podium. 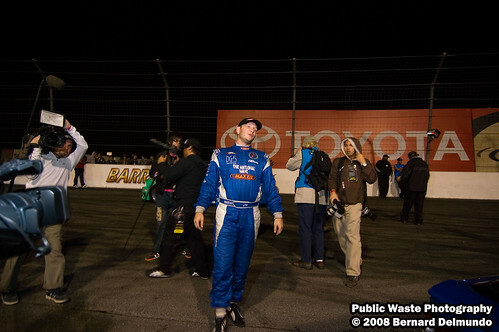 Pawlak’s excitement in the staging area was well warranted. 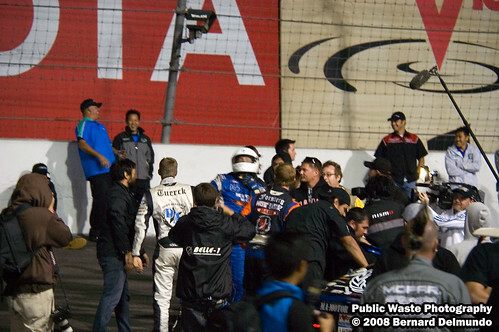 The “Final Fight” took place between Vaughn Gittin and Tanner Foust. Wild, tight competition made this a battle to be seen. 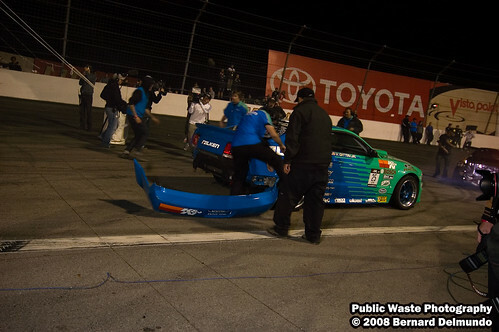 Both drivers lost body panels pulling into the pits as their crews desperately tried to get the cars ready for the last run on the track. 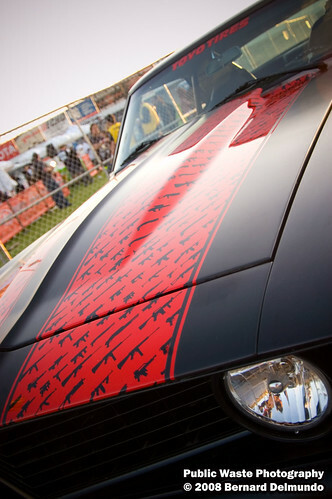 You could feel the tension and high emotion these guys were dealing with as they bolted out from the staging lanes. 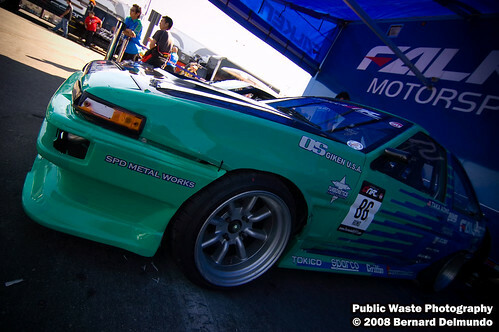 In the end, Gittin ended with the first place position for the final Formula D event of the year. 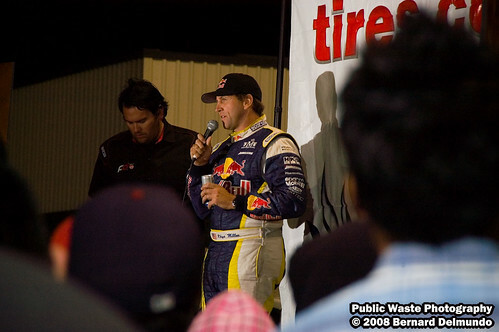 Rhys Millen who experienced an early upset walked away with the Tires.com Triple Crown Championship. 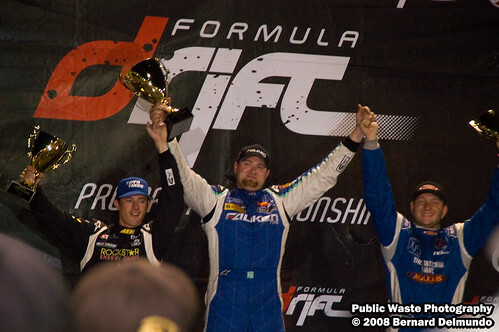 Although Foust was forced to settle for second place for the event he walked away with his second series championship. Congratulations to all the big winners! 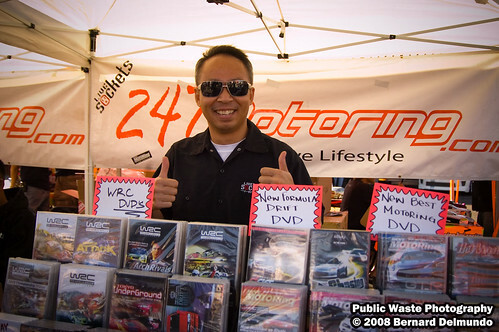 Thanks to all the great people I met that day including the people behind the scenes: John and Nicole of the ID Agency, Formula D corner worker Patrick, and Irwindale Speedway employees John and Pete.